1. How long does it take for my order to be delivered? We aim to deliver within 3 working days. 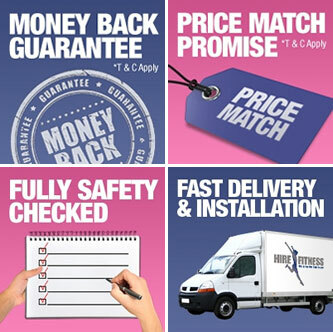 We are sometimes able to deliver out of hours although this may incur an extra charge depending on the circumstances. 2. Do you do any credit checks? 3. Do you carry out any safety checks? 4. Do I need a Credit or Debit Card? Yes. We can only do business with people with a UK or Irish bank account. 5. How do I cancel (return the equipment)? 6. What do I do if I am not sure which piece of equipment would be best for me? 7. What is an Elliptical Cross Trainer? This piece of equipment works both the upper and lower body muscle groups. It has a smooth gliding action which moves naturally with body movement for an impact free workout so it is gentle on the joints; therefore making it an ideal piece of equipment for beginners or older customer. 8. I haven't exercised for a while, what do you recommend? We always recommend that customers consult their doctor as a precautionary measure before undertaking any physical exercise. Hire Fitness staff are unable to give fitness advice in relation to your personal health. 9. Do you offer any discounts if I want to rent more than one piece of equipment? Yes. If you rent three pieces of equipment we will hire you the cheapest piece totally free of charge. This offer is not available online so please call your local Hire Fitness office to to take advantage of this deal. Offer is subject to availability. Ts and Cs apply. 10. Do you offer corporate discounts to companies? Yes. Register your company with us and all staff who take out a rental contract with us will receive discount on the rental prices. 11. Do you insure the equipment? Our equipment is only insured on the premises of Hire Fitness and in transit. It is your responsibility to ensure that your own household or work insurance covers the equipment against all damage risk whilst in your possession. 12. What if I have signed up for a longer contract but find that I am getting bored with the piece of equipment after a few months? We will swap equipment for a small delivery charge (depending on your location) for something completely different to help maintain your motivation. 14. Do you deliver to Ireland?